Beagles are scent hounds, developed in Britain for tracking/hunting rabbits, hare, deer, and various other small game. The modern beagle showed up around the 1830’s but beagle type dogs have been around for over 2000 years. The American Kennel Club recognized the beagle as an official breed in 1885, and they have quickly become one of the most popular breeds in North America. Beagles are small to medium sized dogs, weighing between 18-35 lbs. The most common colour is the classic tri-colour (white, brown, and black) but they can come in various other combinations including two colour varieties, and with ticked or mottled colouring. They have long, floppy ears, and many have a white tip on their tails – something that was selected for through the years, as it made the dogs more visible in long grass while following a scent. Due to their fantastic sense of smell, beagles are often employed by border agencies as detection dogs and search and rescue teams. 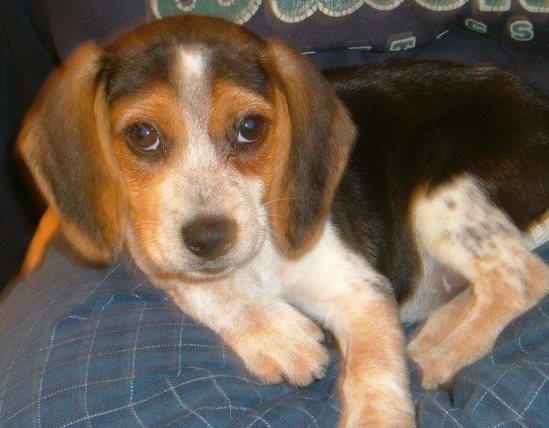 Skittles as an adorable little puppy! 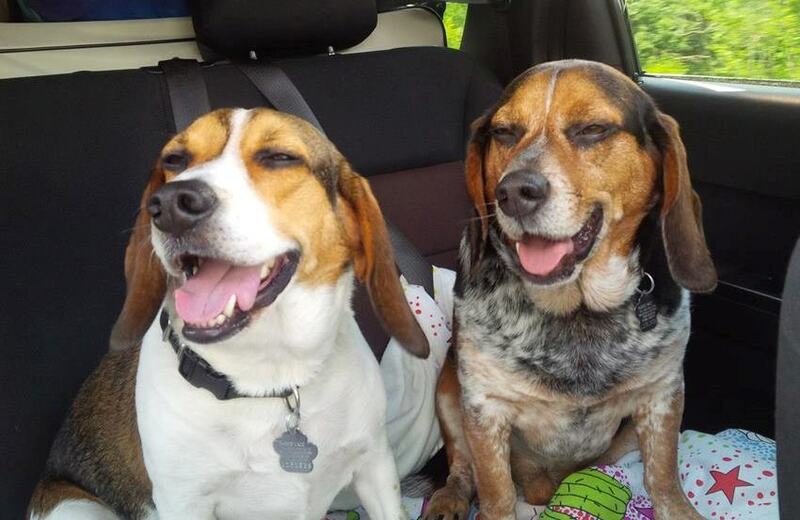 One of the most unique features of the beagle is their tell-tale howl and bay. Almost every beagle I’ve met read the textbook on how to perform the beagle howl: eyes closed, stretch the neck, nose straight up in the air and let it rip! It’s a uniquely “hound dog” thing! Beagles are an active breed, bred for stamina, so in a home setting they can have a tendency to gain weight VERY easily, so regular exercise is VERY important. Their average life-span is 12-15 years. As for medical problems, beagles commonly have problems with recurrent ear infections, weight gain, and hypothyroidism, all of which can be frustrating to treat, but are very manageable. We are featuring 3 patients this time. Skittles wanted to make sure she got to go on vacation too! Meet Skittles! She is an 8 year old female beagle. She was adopted by her family from the OSPCA at 9 weeks of age, and has been coming to Goldenvale ever since. 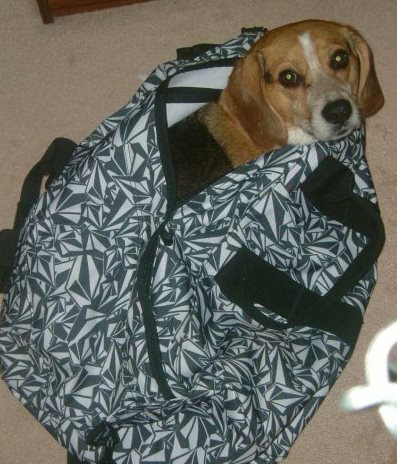 In many ways, she is a textbook beagle; howling, nose to the ground, loyal, and very food driven. Skittles is always up for an adventure and is very social, making it easy to bring her pretty much everywhere (including trips to Toronto on the subway!). No matter where she goes, she is bound to make a friend! But as much as she likes her adventures, she also loves being a couch potato and enjoying time at home with her family. These 2 handsome boys are Marlie and Dexter. They were rescued by their parents last year, and have just turned 3 years old. Adopting 2 at the same time has its perks and its downsides, as Marlie and Dexter’s parents have learned. The 2 are the best of buds! They keep each other company and play all the time. As much as they want to be good boys, sometimes their noses lead them astray and they just can’t help it. They’ve been known to get into various things (the garbage, a few chewed up books) when their parents aren’t home to watch them. 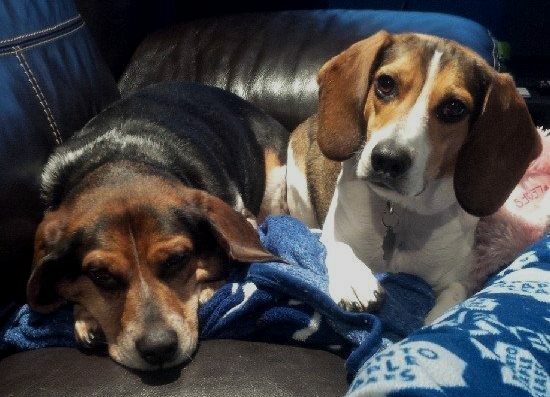 They love going for walks and checking out all the new scents in their neighbourhood, but they can also be found lounging on the couch, watching the Leafs games with their mom and dad. Trivia: Yes, dogs and cats sweat, but not like we do. They only have sweat glands on the pads of their paws! Dogs and cats get rid of most of their excess heat through panting. This is unlike horses, who sweat over their whole body during hard exercise or on hot days. Question: What breed of dog has a black (or blue) tongue?